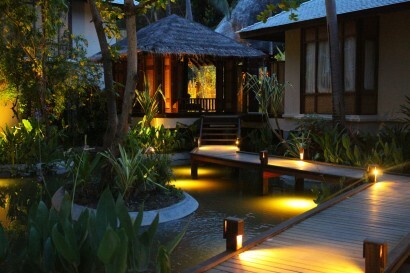 Carla joined Minor Hotels in 2011 as Resort Manager, Naladhu Maldives. 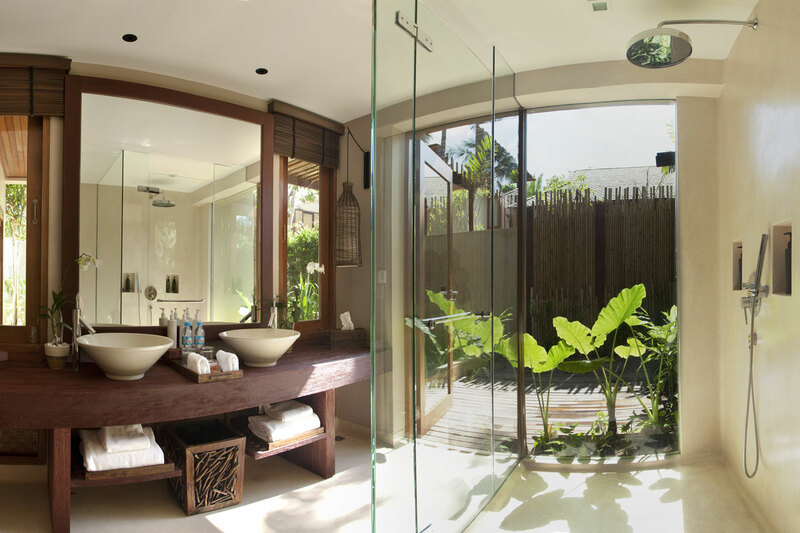 In 2013, she moved to Anantara Layan Phuket Resort as Hotel Manager and played a key role in the successful opening of the property. Carla brought with her a solid hospitality experience in the Middle East, USA, and South Africa. 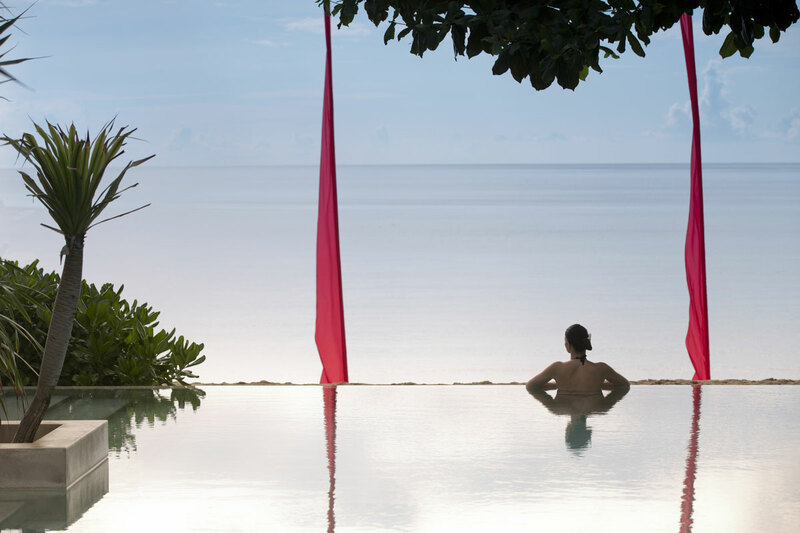 Anantara Rasananda Koh Phangan Villas is an ideal getaway for those craving a quiet and off the beaten track location with amazing beaches. 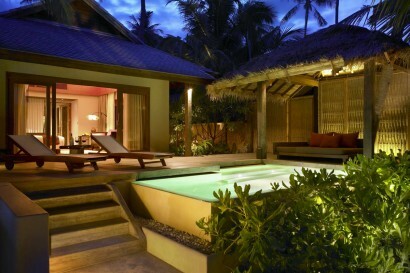 The resort has 64 suites and villas all featuring their very own private plunge pool. 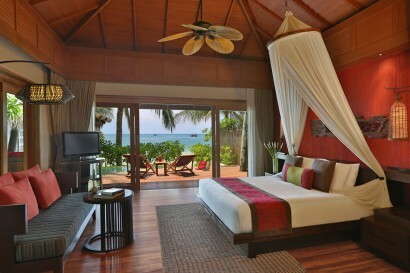 The most luxurious accommodation on the island catering to a more sophisticated crowd. Anantara Rasananda Koh Phangan Villas wasbuilt as the first 5 star on the island of Koh Phangan as has continued to be the market leader in terms of service, standards and overall experience. 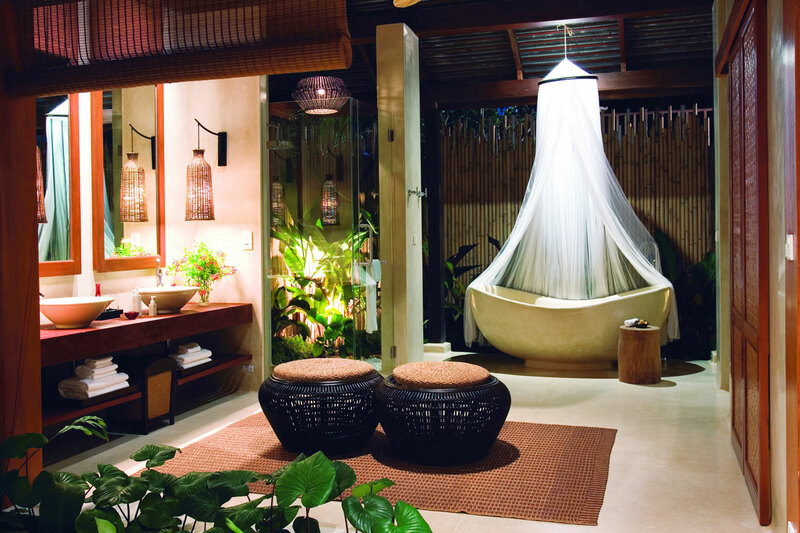 The resort has put Koh Phangan on the map of international travelers, not as a place for famous full moon parties, but as one of the best kept secrets in Thailand with beautiful white sand beaches and all of the charm of Thailand without all the major commercial influences and development that other places have seen. One of, if not, the best beaches in Thailand with great sand and water quality. Arrival Experience – step off the speed boat directly into the ocean as you walk into the resort. 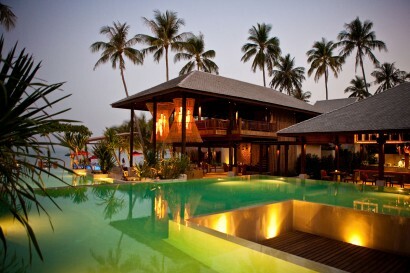 The resort is located on the white sandsof Thong Nai Paan Noi Beach on the Northeast coast of Koh Phangan. 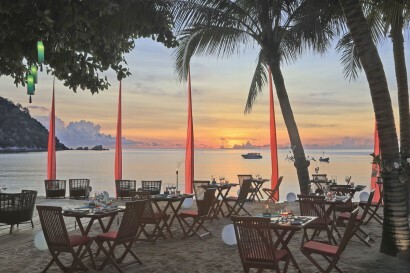 Featuring amazing sunrises, the hotel lies on a quiet part of the island far away from the in famous fullmoon parties that take place in Haad Rin. With 2 km of pristine beach with no vendors or jet skis which are often found in other beach destinations. The area also features a small village located within walking distance of the resort where guests can take in the local ambiance with many restuarants and shops selling local items. 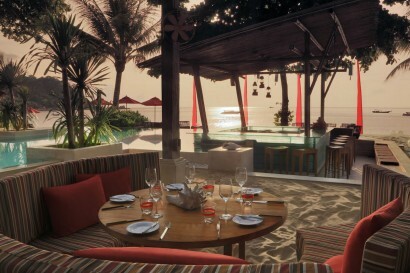 • Beach Dining with Dine by Design, breathtaking views with amazing food. None at the moment, however, in the planning phases to be launched by Q4 2017. No minimum age for children. The first and only Japanese Teppanyaki Restaurant on the island with premium sushi as well as imported meats and succulent seafood from the grill. 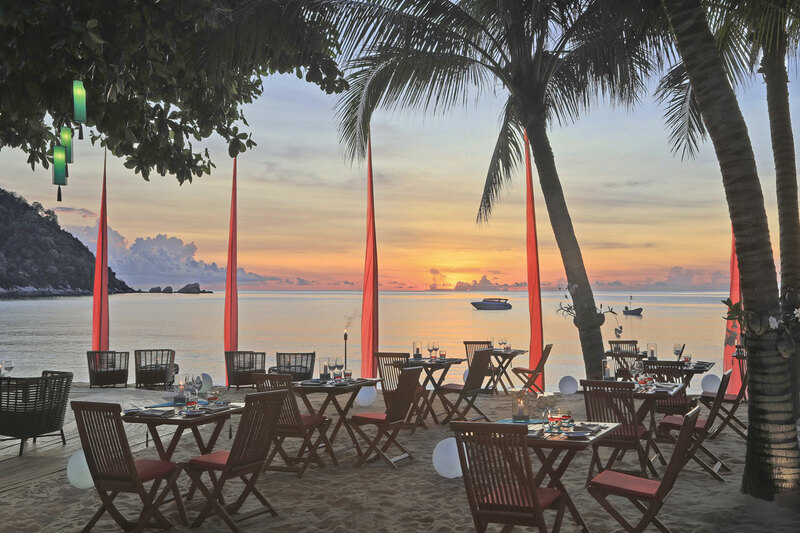 Enjoy true relaxation as you dine with your feet in the sand for breakfast, lunch and dinner at this sea facing restauraunt with both Thai and international favorites. 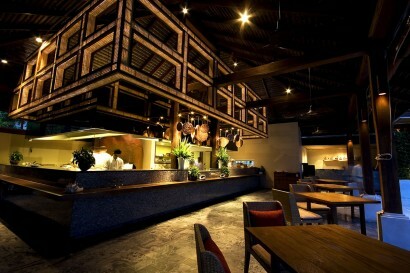 A relaxed casual dining atmosphere to grab a quick snack or watch your favorite sports team while enjoying a wide variety of cocktails and drinks. Halfboard and fullboard options available on request. 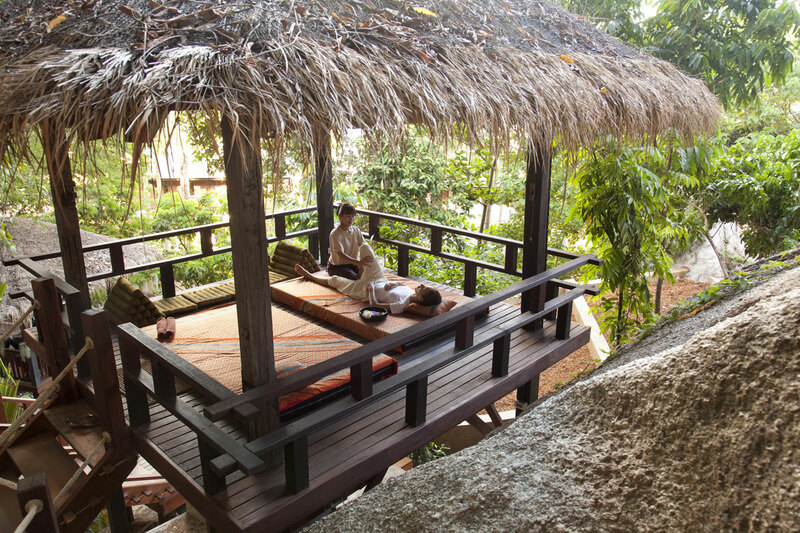 Destiantion spa located within the rock out croppings overlooking Thong Nai Paan Bay. Located on the highest point of the resort overlooking the bay with morning yoga classes and private lessons on request. Weddings – great venue for beach weddings with capacity ranging from small weddings of couples to larger 50 person weddings. • Dine by Design – customised dining directly on the beach, great for romantic evenings and celebrations. • Spice Spoons Cooking Classes – learn the nuances and techniques to prepare mouth watering Thai Cuisine. 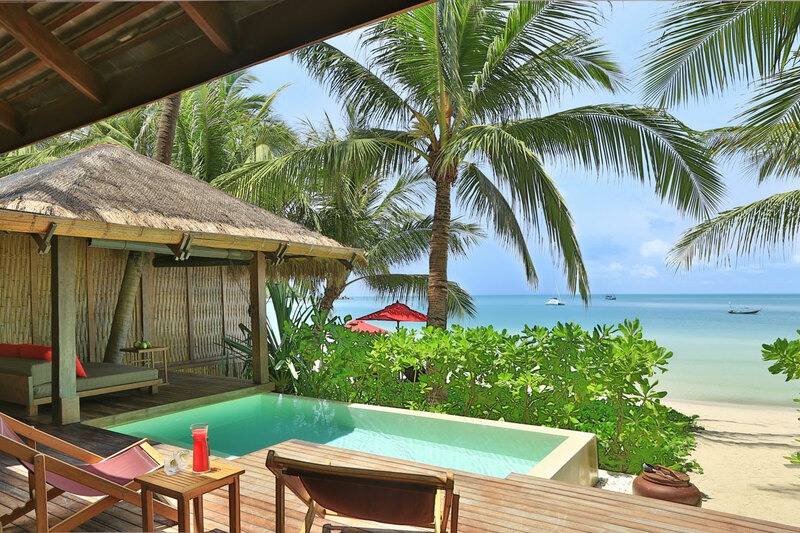 • Island Excursions – explore local islands with greats norkeling and undiscovered white sandbeaches. • Diving – some of the best diving in the Gulf of Thailand at nearby Ang Thong Marine Park and neithboring islands.